How do I check/change if my site will be copied or not in the Annual Site Copy in May? Step 1: Login to shuspace. 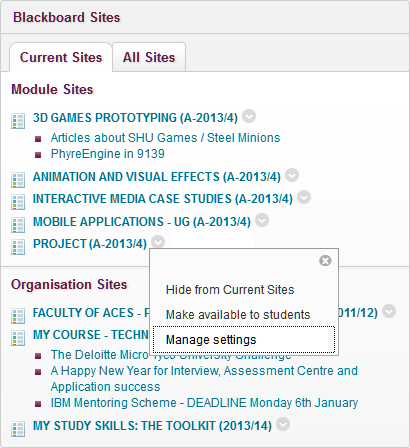 Step 2: In the Blackboard Sites channel, click the drop down chevron next to the site you want to check. Step 4: The Copy Details dropdown menu has two options. Copy and No Copy. If the option is already selected that you want, then there is no need to do anything. If you want the opposite one, then select it and submit. Your request for a changed copy status will be processed by the Bb-admin team with two working days normally. Until that point the site settings page may still have the old details.